MUCH is made of the speed of the greens at Augusta and it is a fair bet that no club golfer can have any real idea of just how quick the putting surfaces really are. At Augusta, it is all about finding the right part of the green with your approach shot. Finish above the hole and you face an almost certain three putts - or worse. In fact, many of the world’s very best golfers have made to look utterly foolish on countless occasions, looking on in horror as they barely touch the ball and watch as it trundles on and on and on…and runs right off the green and finishes 60 yards away at the bottom of slope or ends up in one of the water hazards that guard the surfaces. 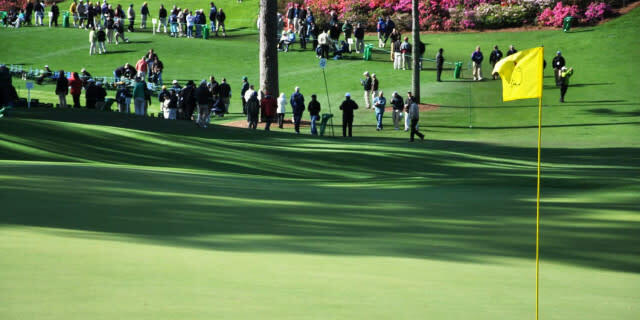 If you can’t putt and you don’t have nerves of steel you can forget about making a decent score at Augusta National, which is precisely why the likes of Jordan Spieth, Jack Nicklaus, Tiger Woods, Nick Faldo and Phil Mickelson have done so well here. Many people will point to Sergio Garcia as a notable exception to the rule but when he won The Masters in 2017 he putted brilliantly. He didn’t have such a happy experience in 2018 when he returned to defend his title, running up a horrific 13 at the par-five 15th - a score caused by the speed of the green, which slopes from back to front and is guarded by a stream. Garcia was safely down the fairway in two but was mortified as he hit a succession of shots that landed close to the hole and then rolled back into the water. Those greens also caused Greg Norman all sorts of problems in 1996 when he went into the final round leading Nick Faldo by four shots but ended up shooting a 78. To find out just how quick the greens really are, you need to speak to somebody who has played in The Masters. Some years ago, I ghosted The Long and the Short Of It, the autobiography of Gary Wolstenholme, one of the finest amateur golfers Britain has ever produced, and a man noted for his incredible touch on and around the greens - hence the title of the book. Wolstenholme was The Amateur Championship on two occasions (1991 and 2003), and both victories entitled him to an invitation to Augusta National. He played in six Walker Cup matches (he memorably defeated Tiger Woods in a singles match despite being outdriven by 80-plus yards) and is GB&I’s record points scorer. He also represented his country on more than 100 occasions. In other words, he was a man who knew his way around a golf course. His proudest moment came when he was paired with Arnold Palmer in 1992. Wolstenholme recorded a 72 in the first round and briefly found his name at the top of the leaderboard. Palmer had a 75, but went out of his way to make the amateur feel relaxed and at home. Wolstenholme still recalls the hairs standing up on the back of his neck as the crowd went crazy when Palmer made his walk to the first tee. It was when he realised that he was in the presence of a true legend of the game. Wolstenholme had practised hard all week and felt that he had mastered the pace of the greens. What he didn’t know was that the greenkeepers head out after everybody has played their final practice round on Wednesday and cut the surfaces even shorter, meaning that they are even faster. The old hands know this and make allowances. In 1992, Wolstenholme was not an old hand. He was an amateur making his first appearance. After finding the fairway with his opening drive (he tends to find most fairways), the Englishman hit what he thought was a decent approach to the first green and was mildly surprised that it finished up at the back. But that was as nothing compared with his reaction when he set his first putt on its way. It was downhill and Wolstenholme feathered the ball. He barely made contact with it but it ran past the hole, kept on going and ran right off the front of the putting surface. He followed his 72 with a 79 as he battled to get to grips with the surfaces. Sadly, it meant he missed the cut, as he also did on his second appearance in 2004. So yes, the greens are fast. Very, very fast.